If the only space you have for incoming pallets is the receiving floor, and it’s a chronic condition, it’s time to look at your various space-saving. process, and expansion options. 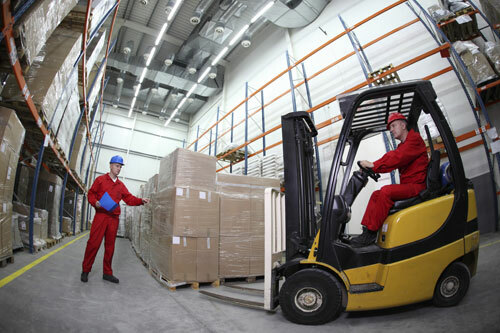 Can your receiving employees quickly locate a storage slot? If there are open rack slots for incoming pallets, but putaway workers don’t have an excellent understanding of where they are, then it is time to develop a more organized slotting system with training program and labeling initiatives so that everyone quickly understands where various SKU’s belong. Match pallets to rack storage slots as they are unloaded. Ideally, pallets shouldn’t touch the ground between trailers and storage positions. For pallets that are broken down for putaway, can they be transported to the various areas for smaller scale staging? Are storage slots constantly full? If certain storage areas are always full, then it’s an inventory control issue. Analyze usage vs. storage to find ways to reduce the needed storage space. If you can’t reduce the amount of inventory, look at overstock and excess inventory – and get rid of it. Alternately, consider new taller racks, a better layout, or other ways to increase storage space. This tends to be advice for a typical operation. If you have seasonal spikes, special projects, or other mitigating factors that temporarily cause full storage slots, it’s another matter. Do you always have overflow storage in the shipping area? This can steal part of that area’s square footage for extended periods. It hits home when trucks are waiting to unload and you can’t receive products, or forklift drivers can’t easily access trailers to unload. When that happens, it’s time to evaluate the decision making process on inventory, on storage areas, and whether or not temporary storage should find another home. If empty pallets occupy floor or rack space, then consider other options to store those pallets. One good way is to move empty pallets to higher density storage in over-door racks. Revisit all of your putaway strategies. Are yours adequate for current SKU’s and order trends? Do you have a clear path between dock door and pallet, carton, and each pick slots? Don’t neglect security concerns. When the receiving dock is full of products awaiting putaway, there is an immediate security issue. Those pallets full of product are particularly good targets for pilferage. They have been received and presumably signed for, so any missing inventory is difficult to trace. If you can’t put away the load quickly, then consider taking steps to secure the higher value shipments. Don’t short the receiving area on its rightful square footage. It’s a common flaw in many operations to short the receiving area of needed square footage. Do you consistently lack space in the receiving or staging areas? Don’t allow other parts of the operation to infringe, even when that area appears to be empty and unused. You’ll regret it when the time comes to effectively process an incoming series of shipments. Are there issues with labor availability? In a multi-shift operation, it’s imperative that shipments are put away before the end of a shift. At a shift change, accountability diminishes greatly. Inability to receive shipments fully can cause putaway problems in terms of product slotting and accuracy. It can get to the point where shift workers are in conflict with each other over shipments that are left from one shift to the next. None of this is conductive to a superior warehouse operation. It’s easy to say that you should just staff for every shipment, but balancing that labor on a daily basis can be difficult. Various WMS and labor management systems are available for truly data-driven decision making. You can also work with your vendors to ensure that shipments arrive when you’re staffed for putaway. Advance notification is always helpful with that. Receiving areas, staging, and putaway processes can become very problematic if these issues linger. It’s always good to review these processes and try to find ways to deal with them before problems emerge.